Western blot analysis of PTPRN2 over-expressed 293 cell line, cotransfected with PTPRN2 Validated Chimera RNAi ( Cat # H00005799-R01V ) (Lane 2) or non-transfected control (Lane 1). Blot probed with PTPRN2 monoclonal antibody (M08), clone 7F8 (Cat # H00005799-M08 ). GAPDH ( 36.1 kDa ) used as specificity and loading control. Western Blot analysis of PTPRN2 expression in transfected 293T cell line by PTPRN2 monoclonal antibody (M08), clone 7F8.Lane 1: PTPRN2 transfected lysate(108.1 KDa).Lane 2: Non-transfected lysate. The PTPRN2 polyclonal antibody ( Cat # PAB4105 ) is used in Western blot to detect PTPRN2 in C6 cell lysate. The anti-PTPIA2 beta N-term Pab is used in Western blot to detect PTPIA2 beta in C6 cell lysate. 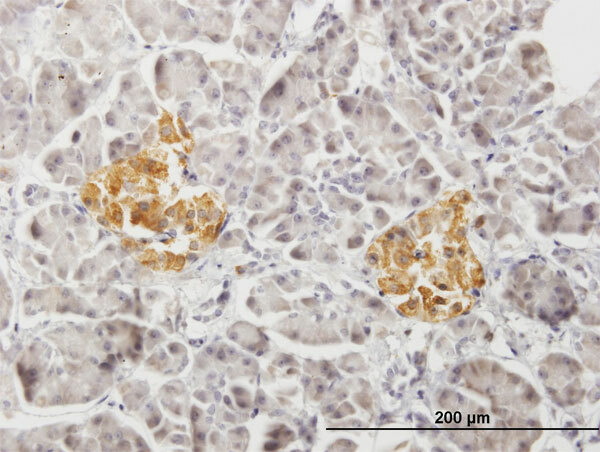 PTPRN2 MaxPab polyclonal antibody. Western Blot analysis of PTPRN2 expression in human kidney. Western Blot analysis of PTPRN2 expression in transfected 293T cell line (H00005799-T04) by PTPRN2 MaxPab polyclonal antibody.Lane 1: PTPRN2 transfected lysate(108.46 KDa).Lane 2: Non-transfected lysate. Western Blot analysis of PTPRN2 expression in transfected 293T cell line (H00005799-T04) by PTPRN2 MaxPab polyclonal antibody.Lane 1: PTPRN2 transfected lysate(108.10 KDa).Lane 2: Non-transfected lysate. Western blot analysis of extracts from NIH-3T3 cells, using PTPRN2 Antibody. The lane on the right is treated with the synthesized peptide. Western blot analysis in A2058 cell line lysates (35ug/lane) using PTPRN2 antibody Cat.-No. AP53516PU-N. 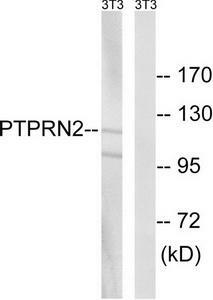 This demonstrates the PTPRN2 antibody detected the PTPRN2 protein (arrow). Western blot analysis of Phogrin expression in HeLa (A); SP2/0 (B); H9C2 (C) whole cell lysates. Western blot analysis of extracts from NIH/3T3 cells, using PTPRN2 antibody.The lane on the right is treated with the synthesized peptide.